I may be misremembering from our first Viking Ocean cruise last year, but I thought they had us email or upload pictures of our passports prior to the cruise. This resulted in no need for them to take a picture when we boarded, our passport picture was already in their system and magically appeared on our stateroom keycard. Am I imagining this? If not, should I be worried that Viking hasn't asked for a jpg of our passports this time around? Maybe they still have our pictures in their system, but they can't have DMIL who is cruising with us this time since she is a VV. Thanks for any help in helping me remember! No picture on the card. It pops up on their screen. Probably take a picture of any new cruiser at the port. Ours were in the system from a river cruise. They scan your passport when you check in. Security photo is taken from that. Ah...they pulled it from our passports. I didn't remember them taking a picture. Curious, Cilcianrqts, why you found it unsettling that they pulled your picture from your passport file? Seems logical to me. no they definitely didn't take our picture. I really remember having to scan my passport at the office and send them a picture of it. maybe they can upload it directly once they have our number rather than having to send them a picture of the passport....how long ago was this for you? We view a passport as a government document for government use when we travel. Use by a private company for “ convenience” is outside that scope. It’s like people objecting to banks copying your drivers license data when you want to cash a check. If they want you to present a photo ID to cash their checks, let them provide it. So before we sailed...interesting. Maybe I am wrong on having to send a picture of our passport in to them. I doubt you had to send a copy in. You probably remember having to fill out all the passport info in your pre-cruise information form. As I stated above, they now scan the passport at check in and use the photo from that. As for being an official government document, that is what they are using as. It is no different than when you check in for an international flight. The airline has an RFID reader that extracts the passport info and links them into the TSA system (in the US anyway) and in turn has access to your photo. 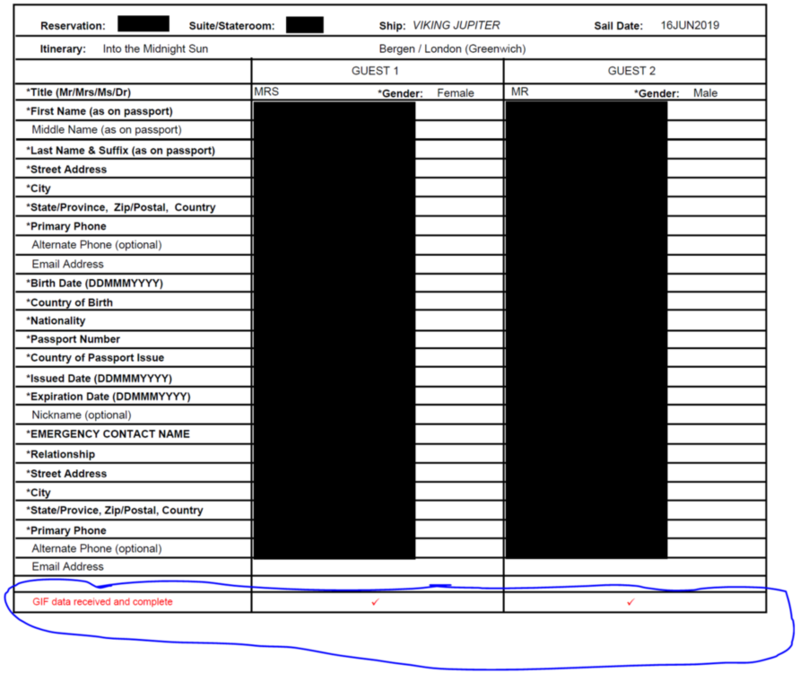 The use of your passport to board an international cruise carries with it the same security requirements as boarding an international flight except they are not tied into any national data system (volume of pax would not justify it). No issue of convenience or invasion of privacy, just security and they are assured that their on board photo matches your passport should an issue arise. Actually, any convenience is that of the pax by not having to fool with having a picture taken. when we checked in mine went thru fine but day two of the cruise we got a note in the room to visit the front desk as DW had no picture on file (computer burp?) and they took her picture to be in their "in and out" file for security. RCCL now asks you upload a picture in their 'online checkin' process to speed things up. I didn't last time <Nov> and it probably added 3 minutes for the gate person to take our pictures .. again, for the security team at the on/off check point. NEVER had to send photo or passport image to Viking. Just sailed again on Viking Ocean a couple months ago. They DID take our photos on boarding day. That ^^^ makes more sense as a current photo is far more useful than an aged passport photo. Thought I’d update this to reflect what we just experienced. Boarded in San Juan on 3/29/19 and checked our waiter’s iPhone at breakfast this morning to see what pictures they had in the system for us. DH & my pictures are our passport pictures which they either retrieved as Previous Posters suggested or from the copy I emailed them (checked old emails and that’s indeed what I did). However, DMIL’s photo was taken at the checkin counter. Her passport is only a year old and is chipped, so not sure why they did hers the old fashioned way. On Orion Feb/Mar. They used our passport pictures. We never sent them in. No photos taken boarding day. Oh, they use our Passport photo? 😥Not sure what happens in other countries but in Australia they do something awful with the photos so a reasonable one on providing it to Customs when you apply for the passport ends up looking like you have died! Mine is disgusting. Other cruise lines take the photo at check in so at least you can smile in it. Pray for a technology failure ! Winner. Tell me, what did you do to break the scanner? Maybe Aussies photos don’t scan well because I think that’s what our passport people do to our photos. I think behind the scenes they have a laugh and use an app to get the worst possible reproduction. Pushka. You are right. I have never seen such a bunch of sour looking people as on Aussie passport photos. No smiles allowed. I will try to break the scanner when we board in Hong Kong in a couple of weeks. I need some of the luck LM had. No recollection of any individual photo. Many states prohibit smiles on driver license photo materials. It confuses the automated face scanners in some places. This is part of "know the customer". It is an effort to combat money-laundering among other similar things. If it is later found money laundering was occurring, the employee is subject to gov't fines, incarceration and obvious termination by the bank. The bank is subject to fines. If the appropriate "know the customer" steps were not taken. I know this because for 19 years I worked for a very large bank and each year I was required to take an anti-money laundering even though I was back office IT person with absolutely no interaction with the customers. Whenever I take in my Audi and before that my Benz for their annual services and request a loaner car they take a photocopy of my driver's license. Correct, and it should not be. Witness the rampant identity theft because it’s so easy to get someone’s info. I know I didn't send them any GIF data, so they must have either gotten it from electronic passport data (via US Govt.) or possibly from our prior VR cruise. I don't remember having a picture taken back then, but our arrival at the boat was fairly hectic, and I could just have forgotten. GIF is the acronym for Guest Information Form.